Simon Fussell speaking to the meeting about the Environmental Quality Mark. 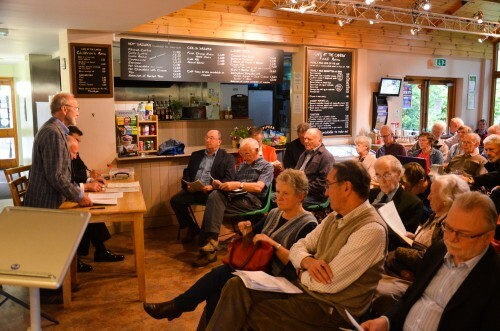 Buxton Civic Association held its 46th AGM on 22nd June at the Poole's Cavern visitor centre. 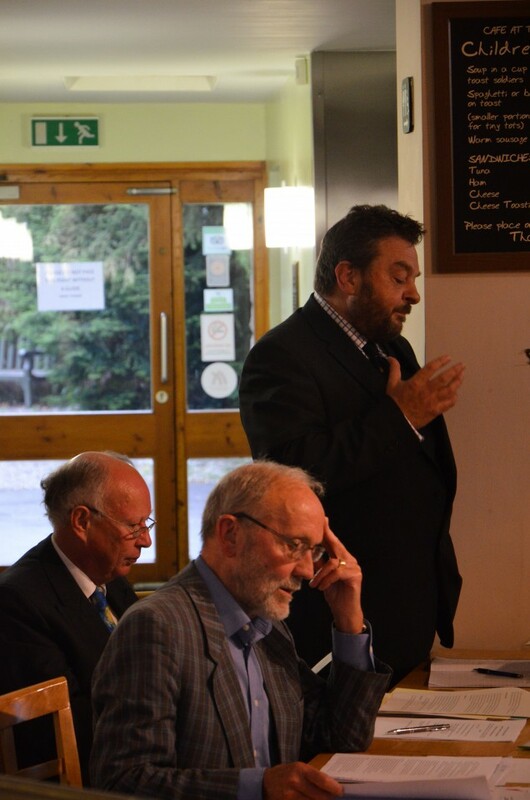 We have posted a few photographs from the evening and a full report will follow later. The minutes from the AGM and copies of the Chair's, Woodland, and Environmental report will also be made available to members. 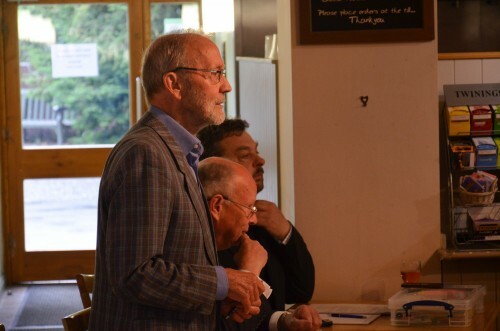 Mike Wilde (Chair of Membership and Communities Committee) Alan Roberts and Simon Fussell took a display of our latest projects into Town on 20th June as part of the Nationwide Civic Day celebrations. 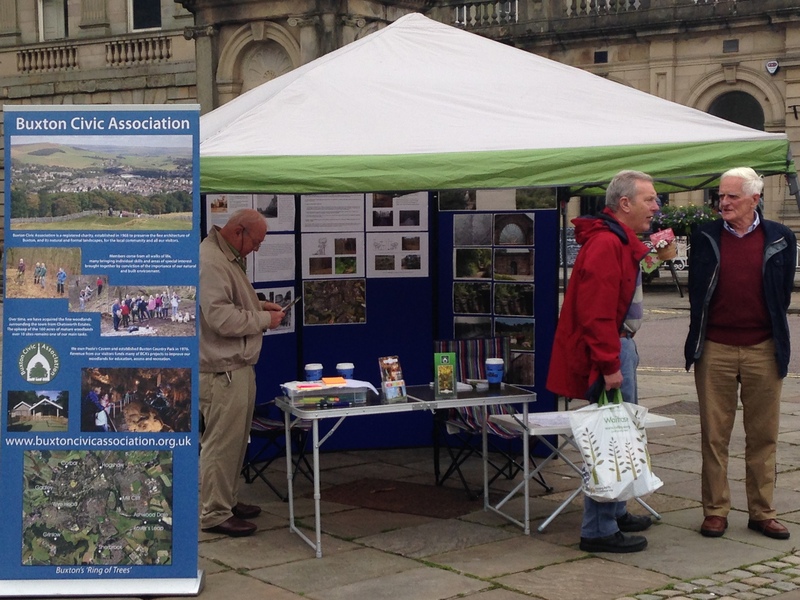 The display generated a lot of interest, especially the Spring Garden canopies project. You can get an update on our projects by downloading our June Newsletter. See Link below. The first half of the butterfly recording season has been completed and Steve Orridge has sent us his interim report. 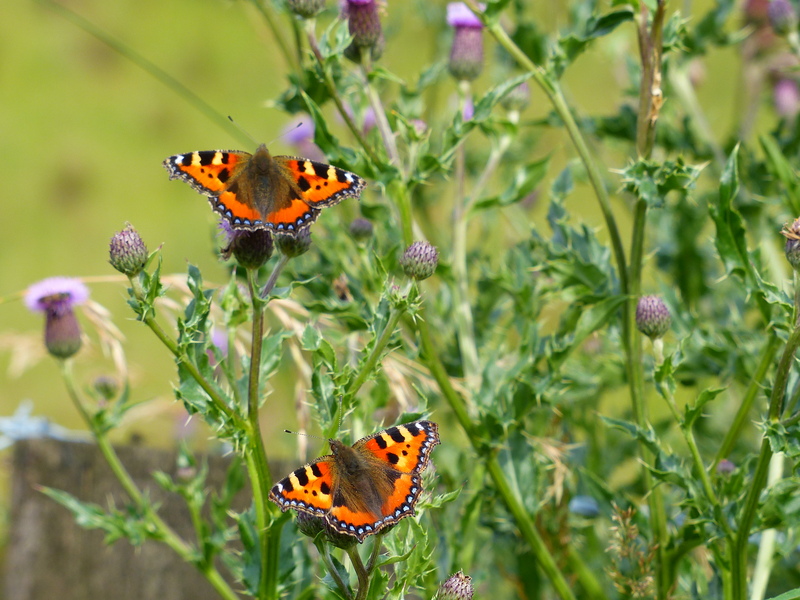 (See below) The unsettled weather has meant that very few Butterflies have been recorded, but with the forecast for July showing signs of warmer settled weather, Steve is hopeful that numbers will improve. 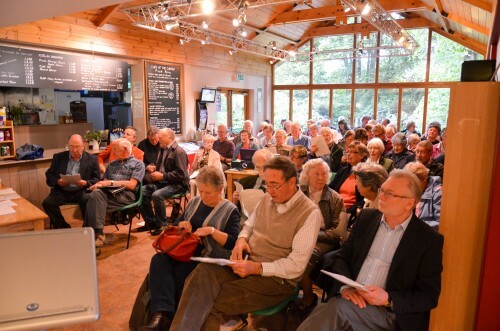 If you are interested in taking part in the survey contact us at communications@buxtoncivicassociation.org.uk. The full report can be read below. There are two coal seams in the high ground to the west of Burbage. One seam, known by various names of the years, including House Coal seam and Ringinglow seam, runs approximately north/south along the line of Burbage Edge and Axe Edge on the western side of the ridge with a steep dip towards the west. The other seam is an isolated seam around the headwaters of the river Goyt and it is known as the Goyt Coal seam. Each of these seams was worked in the 18th and 19th century and in the 17th century to a lesser extent. Output from these small mines was taken from these isolated spots by packhorse along the local turnpikes and "coal roads" and later by a siding connected to the Cromford and High peak Railway (CHPR) that opened in 1831. Coal roads are recorded leading to Hartington, Chelmorton and Taddington. Coal transported via the siding was taken to Grin Low Quarry and Harpur Hill Quarry and so played an important part in the growth of the local lime burning industry. The main centre of surface activity was near the Macclesfield Old Road. Level Lane led to the entrance to the Duke's Level, which still acts as the main drainage channel for the disused mine workings. Further up the Old Road and by footpaths leading from the Old Road along the western side of Axe Edge to Cisterns Clough, many other traces of the old mine workings can be seen. These have been well described in a recent BCA publication entitled "A walking guide to Buxton' Coal Mines", which is available at Poole's Cavern (£2.50). A book "The Coal Mines of Buxton" by A F Roberts and J T Leach gives a more detailed description of the history and layout of the mines. The Goyt mine closed in 1898 while the House Coal workings moved steadily southwards to the Staffordshire border, with a drift tunnel at Cisterns Clough. These workings closed in 1921. 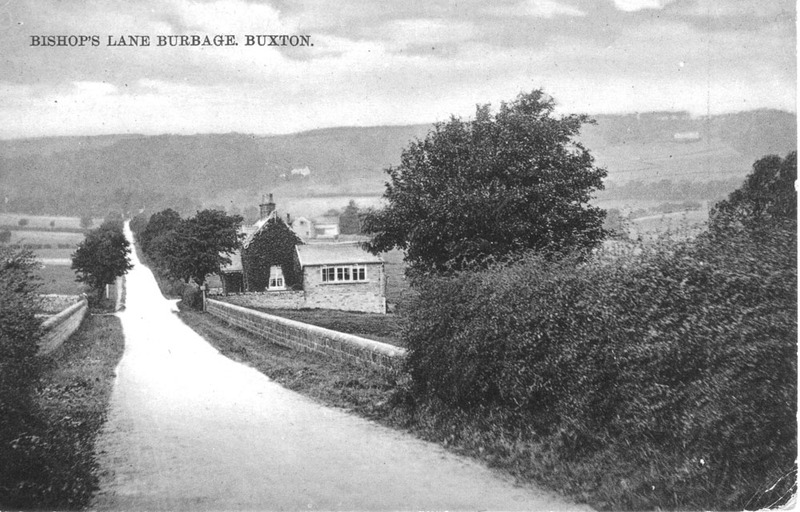 Burbage is situated on the western side of Buxton, where the main roads from Macclesfield and Leek approach the town. At the centre of the village, the church, the "Duke" public house, the village shop, a bowling green, Burbage Band's band hut and the Burbage Institute are clustered together within a few yards of one another. 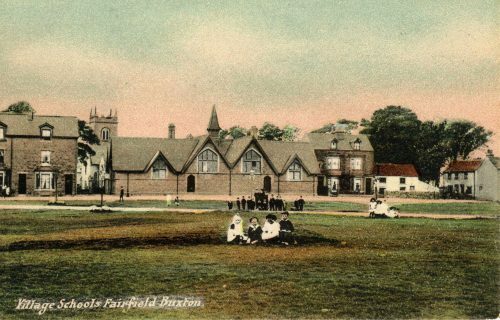 The village school was formerly located in this area before moving to new premises in the 1960s. To the west of Burbage , the ground rises sharply to Burbage Edge, crossed by numerous ancient trails leading to the Goyt valley and on into Cheshire. Two coal seams in this area led to the development of the coal mines of Buxton which, though small by national standards, played an important part in providing fuel for prestige buildings such as the Crescent and Buxton Hall and to the development of the local lime burning industry; this locally produced lime played an essential role in the improvement of large areas for agricultural purposes. Burbage Edge leads on to Axe Edge, to the south, and this high ground is the source of the Derbyshire Wye which flows through Burbage and Buxton on to Ashford and Bakewell to join the Derwent at Rowsley. The earliest land to be cultivated on a larger scale was on the slopes leading up to Burbage Edge where an area of land was enclosed from the rough moorland, probably in the 16th century. 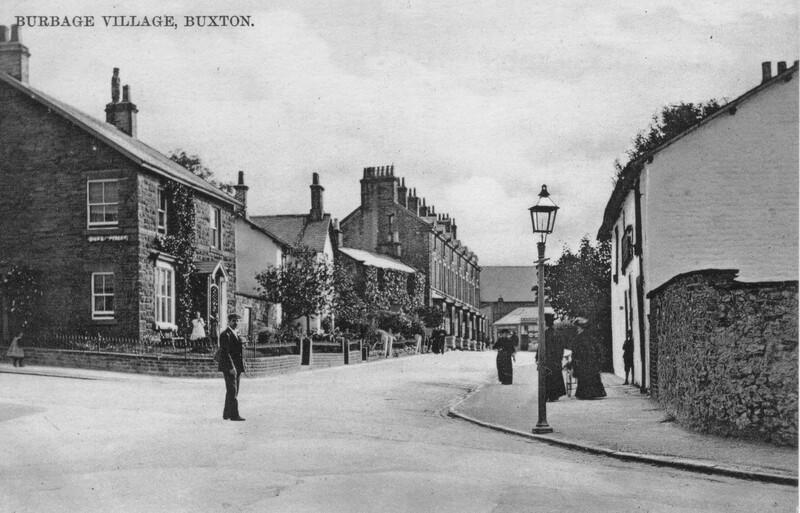 As the population of Buxton grew in the 1950s and subsequently, residential developments led to a steady increase in the built up area of Burbage which now merges with Buxton itself. However, the area still retains its distinctive character. 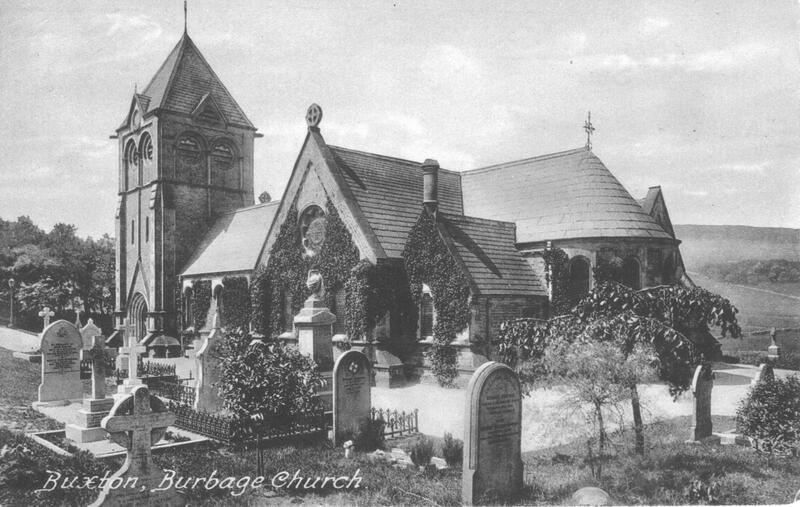 According to the book "Place Names in the Landscape" the place name "Burbage" is of Saxon origin with "Burh" referring to a fort and the "bage" referring either to a ridge or to a stream. Since Burbage is close to the high ridge known as Burbage Edge and has the river Wye running through it, either description fits. Likewise, on the eastern side of the Peak District, on the high ground above Grindleford, we find Burbage Moor, Burbage Rocks and Burbage Brook which runs down Padley Gorge into Grindleford to join the Derwent. A further link between these two Burbage locations is their position as entry points into the White Peak area. In 1759, two Turnpike roads were created linking to Buxton -from the Cheshire plain on the west and South Yorkshire on the east, each of them following long established packhorse routes. The Macclesfield to Buxton Turnpike crossed Burbage Ridge and descended into the Wye valley through Burbage while the Sheffield to Buxton Turnpike came across Ringinglow and Burbage Moor before descending to Hathersage. In the early 900s, the Saxons were advancing against the Danes to extend the area under Saxon control. Derby was taken by the Saxons in 917 and Nottingham in 918. To improve their control over the Peak District, a burh was built at Bakewell in 920, as recorded in the Anglo -Saxon Chronicles. The location of this burh has not been confirmed by archaeological evidence but, based on place name evidence, Trevor Brighton in "Bakewell, the ancient capital of the Peak" suggests the area known as Burton , a short distance from the town of Bakewell which developed as a key Saxon location over the next few years. A burh was also constructed in Manchester in 919. From the recorded pattern of Saxon burhs, it seems possible that Burbage was an intermediate smaller unrecorded burh on the key route from Derby to Manchester via Bakewell, with the eastern Burbage also on an important strategic link up the Derwent valley to South Yorkshire. Each of these Burbage locations has high ground from which a beacon fire warning of invading Danes could have been seen at Burton Moor on the high ground above Bakewell. So, perhaps Burbage was a lonely isolated frontier outpost helping to keep marauding Danes away from Saxon England .... who knows? Can you contribute? We want to add more to our Burbage section. From 1924 onwards, the laboratory was part of a larger unit, with the main laboratory in Sheffield but, in 2005, a new large laboratory building was opened at the Harpur Hill site to accommodate all of the work at the Sheffield laboratory and the existing work on the site. This is the building referred to in the Introduction. Kellingley, the last deep coal mine in Great Britain, closed in December 2015, bringing to an end many centuries of deep coal mining in this country (some open cast coal extraction continues). Any form of mining for minerals has associated safety problems but it has long been recognised that coal mining has additional safety problems because of the possibility of the emission of flammable gas from the coal seams as they are worked. This flammable gas, mainly methane and traditionally referred to as "firedamp" is absorbed within the coal seam and released as the seam is fractured; the quantity of gas released varies from seam to seam and, for a given seam, usually gets larger as the seam is followed to lower depths. During the mediaeval period, Fairfield was a small single street village high up on the limestone plateau of the White Peak as also were Higher Buxton, Chelmorton, Taddington, Sheldon and various other small settlements on either side of the Wye Valley. 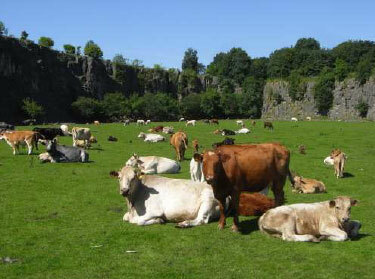 In Norman times, Fairfield was in the Royal Forest of the Peak, the boundary of which lay along the Wye valley. The Tithe Map of 1843 shows the "Township of Fairfield in the Parish of Hope" still as a single street village along Waterswallows Road together with the area around the church, separated by the road leading to Dove Holes but the whole township also covered an extensive rural area. This stretched westwards towards Gadley Lane and Nithen End, with the Wye as the boundary with Buxton township, northwards towards Batham Gate and eastwards to Woo Dale, again with the Wye as the southern boundary. 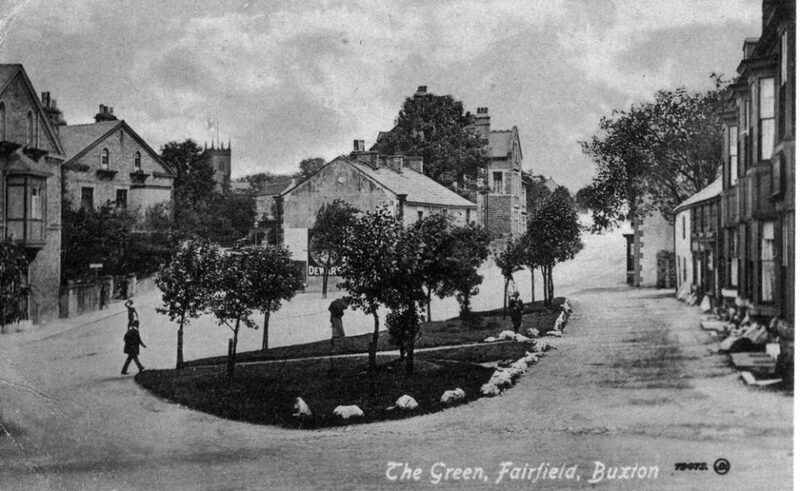 So, before the creation of the borough of Buxton in the late 19th century, the area now occupied by Park Road, the Devonshire Dome, Corbar Woods and Corbar road were in the Fairfield Township. 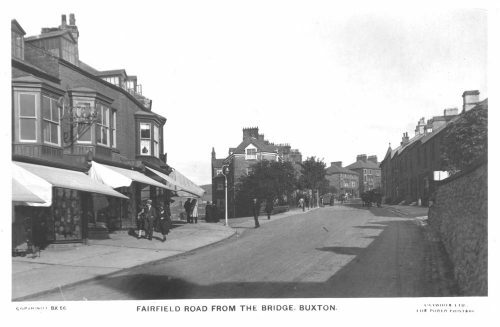 Fairfield Road is one of the major road arteries of Buxton (now the A6). 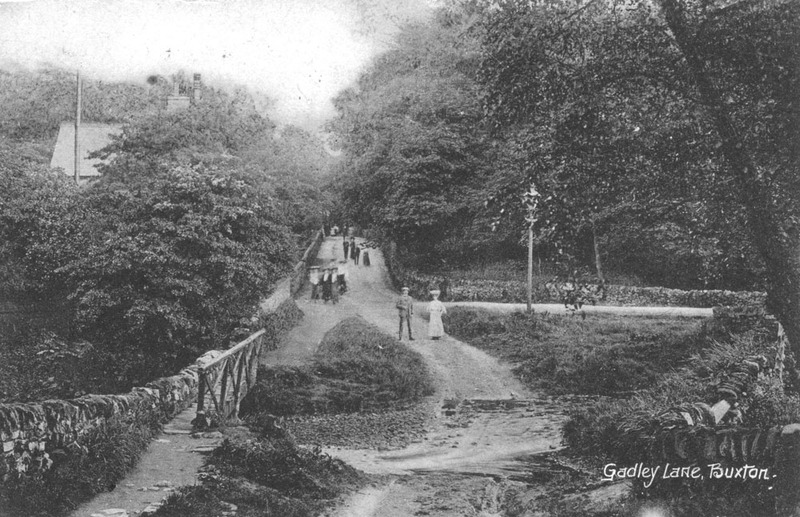 Established as a Turnpike Road to Sheffield in 1759 with the later addition of a branch towards Barmoor Clough in 1820, the steep climb from the river valley leads to congestion problems at busy times. We would like to add more to our Fairfield section. Do you have images that you could contribute? Please get in touch. In the late 1930s, as the threat of war again developed over Europe, the Army, Navy and Royal Air Force were each looking for additional sites for the storage of weapons, ammunition and bombs. The preferred criteria for sites for ammunition and bombs were in disused mines (to give protection against aerial attack) and north of a line from the Bristol Channel to the Humber to increase the distance from German air fields. The three branches of the U K armed services were in competition with each other in this search and the RAF was slower off the mark than its competitors. It became apparent that there was a distinct shortage of suitable disused mine sites and a further approach was required. For this reason, the Frith site at Harpur Hill was again selected as a key location in the nation's defence system, as a site for a new design of major bomb store. The design concept for the Harpur Hill store was a series of reinforced concrete galleries that would be covered by 60 feet of overburden, to give a similar level of protection against a bombing raid as would be provided by subterranean tunnels. As with the WW1 artillery range, the proximity of the site to Harpur Hill quarry, with its rail connection and other services, was favourable to the choice of site and an additional feature was the large quantity of quarry waste immediately available for covering the galleries on their completion. 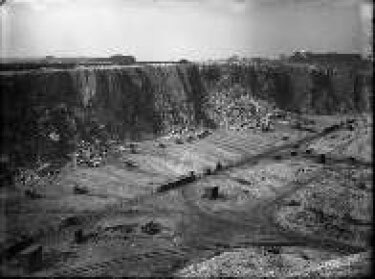 Furthermore, the close proximity of the large quarry meant that the construction work close by could easily be mistaken for quarry related activities in aerial reconnaissance. The site was selected in 1938 and construction work began shorttly afterwards, with the RAF taking over in December 1939. 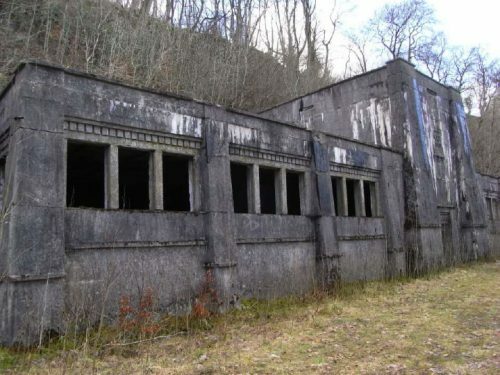 The site was known formally as RAF Maintenance Unit 28 and it continued in operation until December 1960, with important effects for the town. The design of the site was regarded as a success and a second site, to a similar design, was built in the large slate quarry at Llanberis in North Wales. 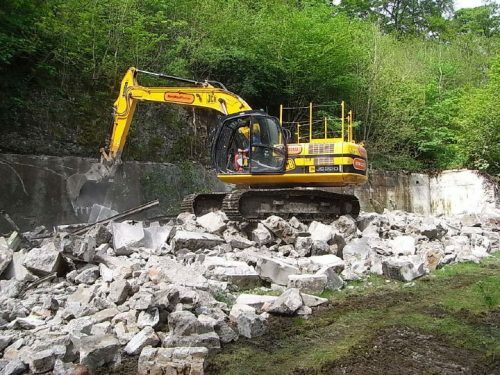 However, during the adding of the overburden at the Llanberis site, large cracks were noticed in the concrete walls of the galleries and construction work ceased. Checks were then made at the Harpur Hill site and similar cracks were observed. The bombs were removed temporarily, in case of collapse, and a large part of the overburden was removed before the bombs were replaced in the repaired galleries. Soon after the First World War broke out in August 1914, it became obvious that the British Expeditionary Force in France was ill prepared for the type of conflict that had developed. With both sides digging into trenches from the Channel coast to the Swiss border, the requirements were for types and quantities of artillery and ammunition that simply were not available to the BEF. The War Office systems for weapons procurement were bureaucratic and out of date. Artillery production was limited to Royal Ordnance Factories and a few specialised firms, such as Vickers, and the production of shell cases and facilities for shell filling were similarly limited. As the supply situation worsened during early 1915, David Lloyd George, the Chancellor of the Exchequer in Asquith's Government, pressed for radical changes in the supply lines which led to the creation of the Ministry of Munitions in May 1915, with Lloyd George as the Minister in charge. Even then the Whitehall battles continued, with the War Office resisting the changes proposed by Lloyd George. At one time, before the new Ministry had acquired the financial authority to purchase equipment, Lloyd George ordered a batch of mortars that were desperately needed, against the security of a financial guarantee by an Indian Maharajah, because the War Office system was so slow! However, by December 1915, all responsibility for procurement and development of military equipment had been passed to the Ministry of Munitions. One problem that arose from the contracting out of manufacture was the need for proof testing of mortars before use. Accidents from faulty manufacture could prove fatal at the point of use. Existing ROF proof ranges, at Woolwich Arsenal and Shoeburyness (on the Essex coast) were insufficient and an additional proof test range was required. The search began for a new range. "An important result of the manufacture of mortars by the trade was the organisation of a system of proof. So long as trench howitzers had been produced only by the Ordnance Factory and Vickers the only tests applied were departmental inspections in the one case and a firing test on the firm's own range in the other. in the autumn of 1915 it was decided to take Vickers' certificate of proof but to prove other trade-made mortars at Woolwich. 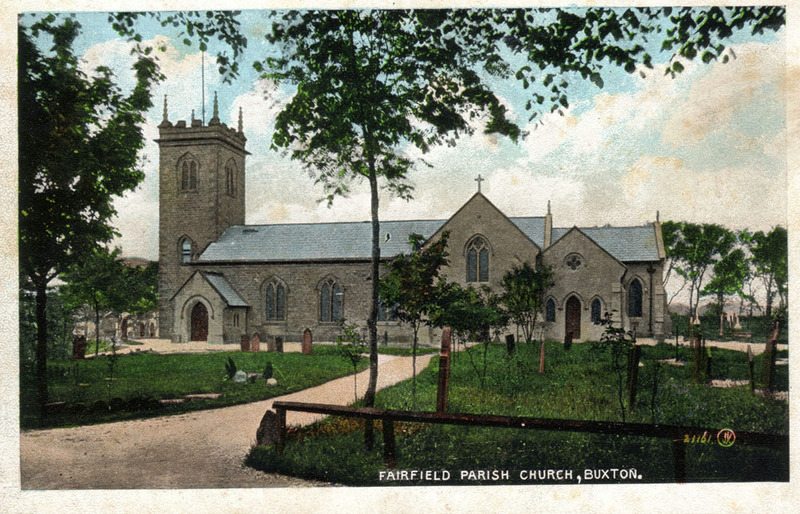 In the spring of 1916, when mortars and ammunition were coming forward in unprecedented quantities, a distinct proof range was established for trench mortars at Buxton." "The breaking down of obsolete stores and the rectification of those rejected became a matter of importance during 1917 by reason of the general shortage of material. It was laid down ... that all rectification which involved explosive risks .... should generally be restricted to national factories. 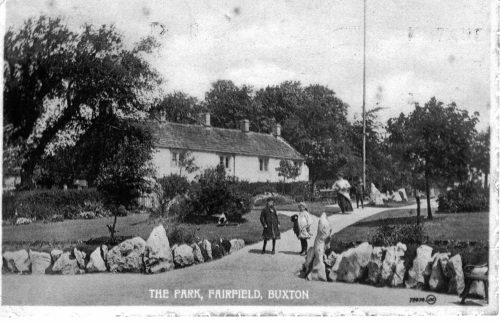 For this reason plant for rectifying trench mortars was installed at the Buxton store in July, 1917"
Information relating to this range can be found in a file at the National Archives at Kew (dealing with Ministry of Munitions papers, and the setting up the site) and in a file in the Chatsworth Archives (dealing with estate matters, the tenant farmers, restoration of the site etc). So far, no detailed information has been located on the types and numbers of weapons tested but it seems likely that a high proportion, if not all, of the Trench Mortars listed above were proof tested at The Frith range, making a major contribution to the efforts of the Army in France and elsewhere. As one example, the 3 inch Stokes mortar became the standard Trench Mortar in the winter of 1915 and in the second half of 1916, production of these mortars was between 100 and 200 per week. The importance and rapid development of trench warfare initiated a conference at which D.G.M.D., D.T.W.S. and D.G.I.M. were represented, and the necessity of the immediate provision of a separate range for proving Trench Mortars and other trench warfare munitions was shown. The duty of finding and establishing a suitable range was charged to this department. The S. of E. and the D.I.G.G. have approved the site, now known as the Frith Range, Buxton, which possesses many special advantages, and the negotiation for the land is being carried through by the Land Agent of the Northern Command under instructions of the Comptroller of Lands, War Office. Plans have been prepared for laying out the site and for the erection of the buildings and works necessary to cover the requirements of the S. of E. and D.I.G.G., whose approval they have received. With a view to acceleration and economy, Messrs. Pauling and Co. Ltd, Victoria Street, S. W. have been engaged, provisionally, as Construction Engineers on a commission basis of 2.5% on cost, plus extra allowances.. This firm is being employed on similar work under agreement by the Explosives Branch of the Ministry, who report the utmost satisfaction. Every effort is being made to advance this work sufficiently to allow a Military Camp to become established and commence firing in 14 days' time. Enclosed are prints showing the site and plans of the buildings agreed upon, and a draft agreement, revised by the legal department, with Messrs. Pauling and Co. Ltd.
Certain movable equipment will be supplied by S. of E., and the necessary expenditure for works and plant, for which financial sanction is asked, has been estimated at £17,000. The works include Fencing; Railway connection, sidings and trollies; Levelling and Roadways; Mess Room, Barracks; Sheds and stables; Examination rooms, stores, magazines and danger buildings; Firing point works; Lighting, heating and water supply; Equipment and fittings, telephones." D.G.I.M., Director General of Inspection of Munitions D.I.G.G., ? I should be extremely grateful if you could help me in the following matter. The War Office has asked me to identify any site which may exist in the Command area for the use of the Trench Warfare Department. That Department is anxious to get land in the Midlands, North Midlands or South Yorkshire. The area required would be rectangular, two miles long by one mile wide. About one acre of this land would be required for buildings. As much of the area as possible should be visible from the firing point from which it should preferably slope downwards. The soil should be dry. There will be a good deal of heavy transport so it is desirable the site should be within four or five miles of a station and the nearer the better. The matter appears to be of much urgency. It seems to me that possibly there are many waste tracts or tracts of land of little agricultural value in the North Midlands which would meet the requirements set out above. Moorland, heath etc on light soil might suit. Land of this description is not always known of by the War Department and there is therefore a possible chance of you being able to help me in this matter, by suggesting any possible site so that we may more expeditiously meet the requirements of the Trench Warfare Department. I should therefore be grateful if you could treat this as urgent and send me any particulars of any suitable site accompanying the same if possible by a plan. Captain Northern Command Land Agent"
"I am directed to inform you that certain land in the vicinity of the Frith has been definitely selected by the Ministry of Munitions for Trench Mortar Range. Official notice signed by competent military authority has been served on each tenant and a separate plan has been served with that notice explaining in detail portions of their farm in respect of which total and exclusive possession is required." The National Archives file covers the issues relating to the legal basis for setting up the range, the commissioning of a building contractor and the connections of the range to the railway and to electricity and water supplies. In each case, the urgency of the project is emphasised.
" The Frith Artillery Range: The land between Harpurhill Works and Anthony Hill on the North, and the river Dove on the south, and between Thirkelow and Booth on the west, and the disused tramway and the road from Harley Cross Gate to the cross roads at Glutton Dale on the east." In addition, stores, a firing shed, examination rooms and a magazine were constructed. 1162 yards of railway track were laid down, with one main track connected to the LNWR line and one siding. On site, about 300 yards of road were constructed for the quarters and about 500 yards for the operational area. Originally, there was no road access to the site so that an access road 1342 yards long was constructed past the Ferney Bottom farm buildings. The present day road follows the same line, although with modern improvements. There is no plan of the site layout on the file but there is a plan for the connection of the railway siding to the LNWR line which shows that this siding used the long straight disused section of the CHPR line, running approximately north/south. This same line is shown on the 6 inch to the mile Ordnance survey map, published 1923, together with two buildings fairly close to the LNWR route. These buildings probably correspond to the buildings constructed by Pauling for the range. All of the land taken by the range was owned by the Duke of Devonshire and let out to tenant farmers who, obviously, experienced unsettling conditions. During the construction and fencing of the range, some problems arose with the tenants for the areas remaining with farmers. In one case, Drewry, the Duke's agent wrote that "fences are impossible as these are mountain sheep that can not be kept on restricted areas of land". In another case, there were protests because walls had been broken down and not repaired, leading to the loss of stock. In July 1916, Captain Brighton arranged an on site meeting with Drewry and the tenants and no further problems are recorded. By the end of October 1916, construction work was almost finished and compensation arrangements were discussed. It was agreed that, from the 10th August 1916 (which seems to have been the actual takeover date), the tenants' rents would be reduced in proportion to the amount of land taken by the range and the Duke of Devonshire would be compensated by the Defence of the Realm Losses Commission. Throughout the war, there was a steady improvement in the performance of trench mortars with regard to reliability, power and range. The Official History noted that the different types of mortars in use in 1915 had ranges from 340 to 900 yards. By 1917, some mortars had ranges up to 2000 yards. 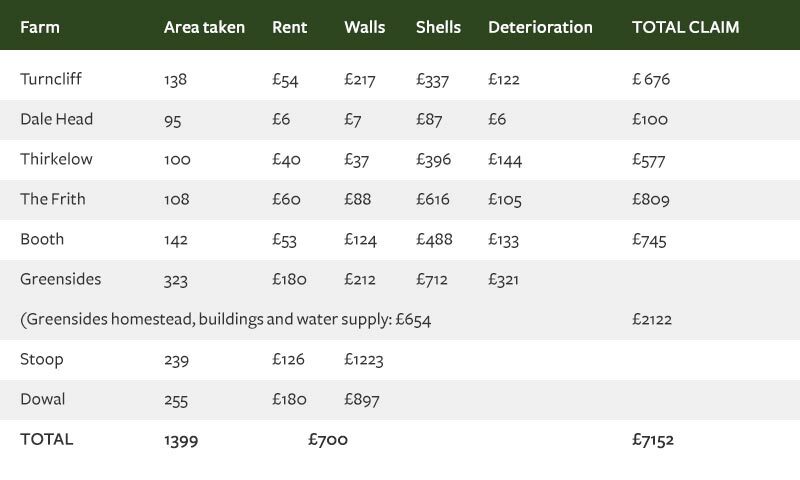 This increase in range required an extension of the range boundary at Greensides Farm(which was about 2000 yards from the firing point) and the vacating of the farm buildings. An unexpected consequence of this change was the interruption to the water supply to some local dairy farms. 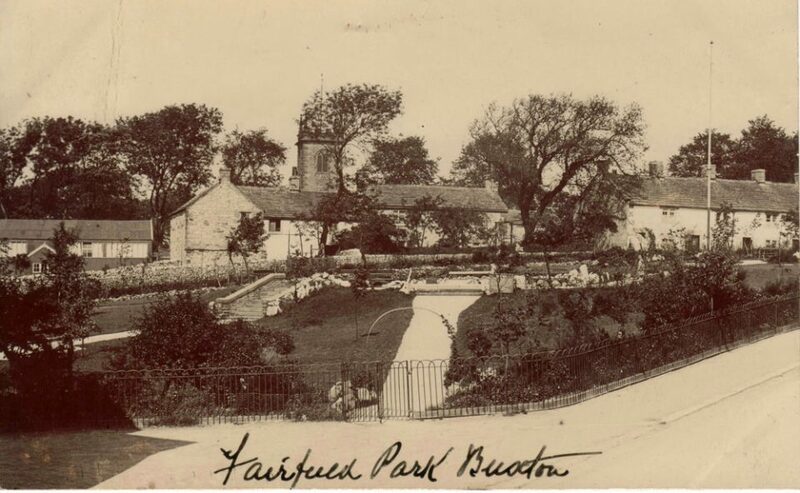 A reservoir had been constructed on Greensides Farm land which was supplied from a local spring, with the water pumped up by two ram pumps. Of the seven farms supplied from this reservoir, five were outside the range boundary. Although the reservoir and the pumps were protected by earth mounding, the shock waves from the exploding shells travelled through the ground and tripped out the pumps. 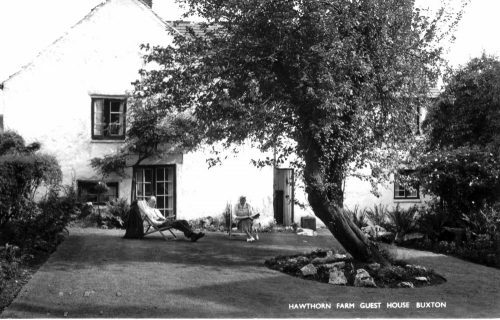 Since the farm was now unoccupied and there was no civilian access to the site, the pumps remained out of action for long periods of time and the water supply to the farms failed. A letter from the Devonshire Estate Office in Buxton noted that this was interfering with important milk supplies to Manchester, Buxton and the Glutton Cheese Factory. After some delay, the problem was solved by the purchase of an oil fired pump to raise the spring water to the reservoir. So far, no detailed information on the number and type of trench mortars tested at the Frith has been located. One account states "as far as I am aware, all of the trench mortars manufactured and sent abroad were proof tested at the Frith". The Official History records that in 1917, for example, about 6000 trench mortars were produced. Whatever the numbers the Frith Artillery Range clearly played a vital part in the equipping of the British forces on the western front. Although the site is little known locally, some evidence of its activities remained. In the late 1970s, building work on the HSL site began to turn up significant quantities of shell fragments remained. These were cleared to allow the buildings to be completed but a follow up operation lasting several months removed over 30,000 shell fragments. As recently as February 2016, work on the preparation of the Peak Cycle Link Trail near Stake Side, turned up further fragments. As our places and spaces evolve we can continue to improve on our surroundings. For a positive change it is important to capture and record our impact on the area. How do we keep our places & Spaces in Check?